Scientists know that Mars used to be a lot warmer and wetter than it is now, so the million-dollar question is where that dense atmosphere went. Perhaps it’s trapped in the planet’s crust, particularly its polar ice caps. Or maybe something else happened…that’s what MAVEN’s trying to find out. On Monday, Bruce Jakosky, principal investigator for MAVEN, announced that scientists’ current theory about the depletion of Mars’ atmosphere involves solar wind permeating it, allowing it to escape into space. Atmospheres are generally divided into upper and lower. Part of the upper atmosphere is the ionosphere, which protects the planet from the particles brought by solar wind. But the ionosphere wasn’t able to continue shielding the planet after the Mars’ core cooled down. 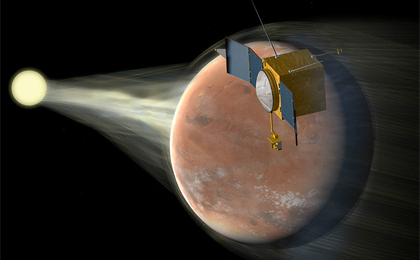 When MAVEN took readings from Mars’ upper and lower atmospheres, it found particles from solar wind a lot lower than scientists expected. The ionosphere can protect a planet from charged particles, but apparently not from neutral particles. As those neutral particles descend into the lower atmosphere, they can become charged, and then they behave much like solar wind, which damages the atmosphere. Understanding how the particles were able to descend so low and gain a charge will be a continued focus of MAVEN’s work. The lower atmosphere is what dictates a planet’s climate, so MAVEN will use something called a Neutral Gas and Ion Mass Spectrometer to further study the relationship between atmosphere depletion and solar wind, and to try and figure out if gases from the lower atmosphere are escaping and impacting the upper atmosphere. MAVEN has also detected that the charged particles cause tears in the atmosphere when they leave it — much like breaking through a membrane, when those particles head back out toward space, they have to rip through an atmosphere that usually repels them. MAVEN will continue to use its Suprathermal and Thermal Ion Composition instrument to try and figure out the rate at which that’s happening, and try to construct a timeline into the past to try and pinpoint when and how this process first started.